A few weeks ago I posted the photo on the left below as a teaser of things to come. Now it's time for the reveal. There's nothing quite like finishing a project and actually liking the result! While I was pleased with the way the Dymondia margaretae had filled this 16-inch wide strip, I felt like I was letting an opportunity go to waste. Being the plant hoarder collector that I am, I'm always looking to free up more space for even more plants. This strip was a perfect takeover target. The first step was to dig up the Dymondia margaretae. It wasn't difficult but I was still surprised by how firmly anchored its tap roots were. The dymondia didn't go to waste; I transplanted it into the “lawn” area in the backyard. The second step was leveling the soil and topping it with rock. I initially chose limestone but it turned out to be too blue for my liking so I dumped a couple of bags (3/4 cu. ft. each) of 3/8-in. black basalt from American Soil & Stone on top. Perfect. The basalt is black when wet and neutral gray when dry. The main feature of this strip is now a 15×15×35-inch Corten planter. I found it on eBay at a great price, with free shipping (a big benefit when buying things made of metal). Digging it up wasn't hard. I wrapped it in two old towels and secured them with a bungee cord. Then I dug as wide a rootball as possible although I was limited by the other plants growing nearby. Fortunately, cacti generally re-root easily so it isn't critical if you chop off some roots. My initial idea had been to separate the six stems and space them evenly in the Corten planter. However, the stems were connected tightly and I couldn't bring myself to separating them. As I result, I centered the clump in the container. This leaves room on either side for a few more plants. 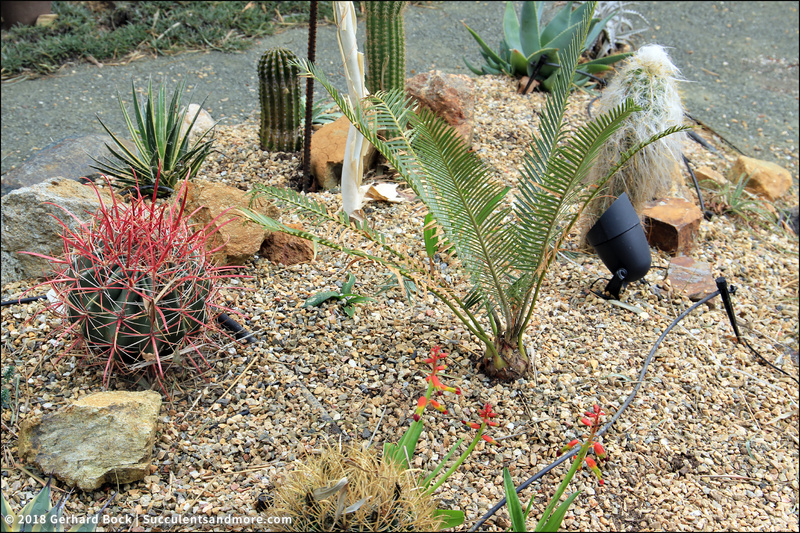 The spiky thing you see on the right in the photo below is a Dyckia marnier-lapostollei. I may or may not plant it there. I have some hechtias and a few other dyckias coming in the mail, so I'm sure I'll find a combination to my liking. Update to follow. 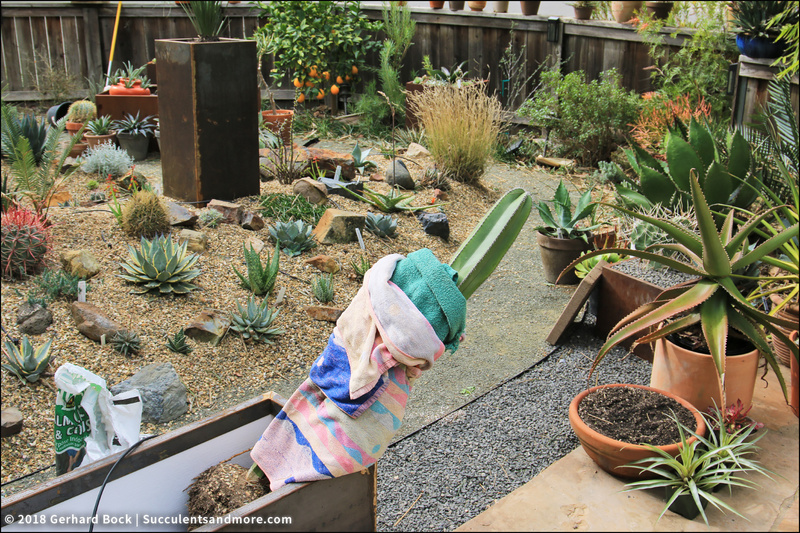 In addition to the Mexican fencepost cactus, I also moved an Echinopsis hybrid (you see it in its in new spot on the left in the photo below). 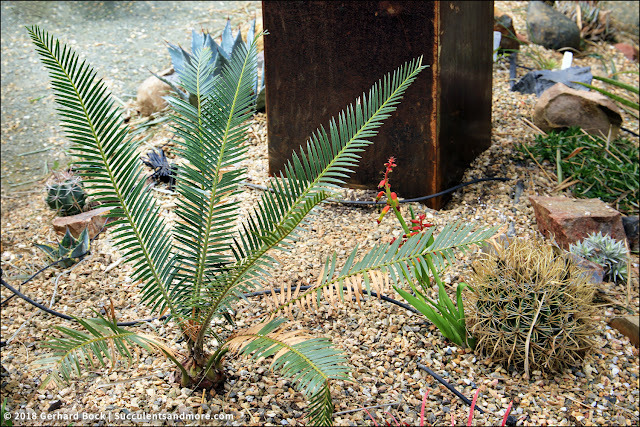 This made room for the new centerpiece of this bed: Dioon argenteum, a cycad from Mexico. Right now its leaves are green, but as it gets older, it will produce leaves with a silver sheen. 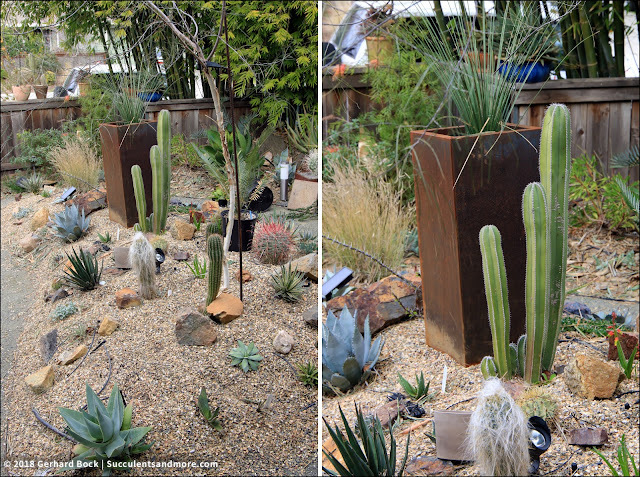 Another big change in this mound is the tall Corten planter you've already seen in the photos above. It adds an element of height that had been missing. I planted a Dasylirion longissimum, which, over time, will turn into a fountain of thin green leaves. 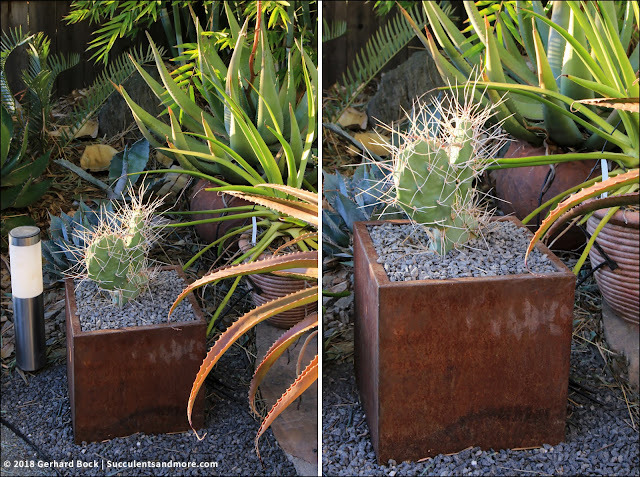 To wrap things up, there's a third Corten planter I want to show you. It's the 12×12×12-inch cube I bought in December at Roger's Gardens in Orange County. It's at the other end of the strip I filled with crushed basalt The Opuntia sulphurea plays off the Mexican fencepost cactus in the larger Corten planter. 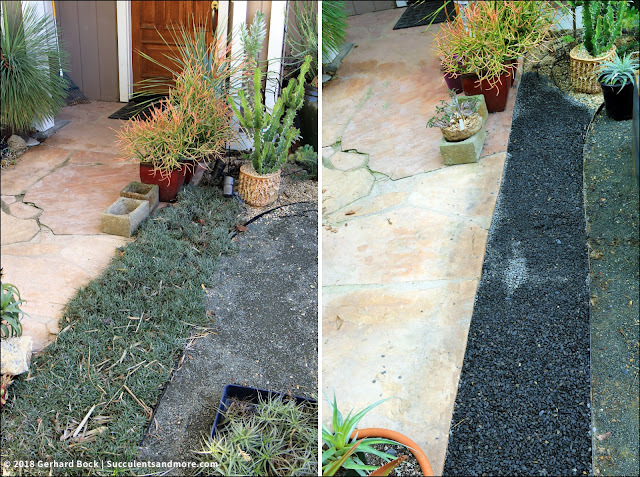 So there you have it: a small makeover that amps up the visual appeal of these areas in the front yard. 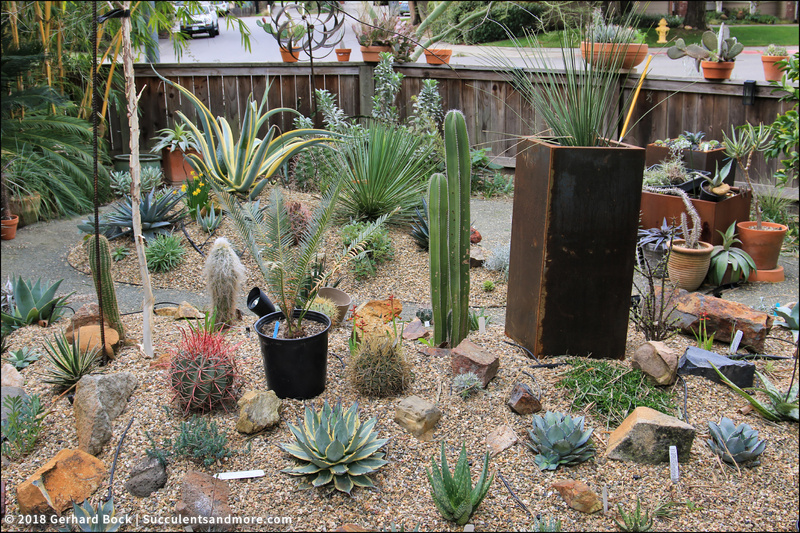 Looks great, and a lot of work done...I recognize some of those new plants! 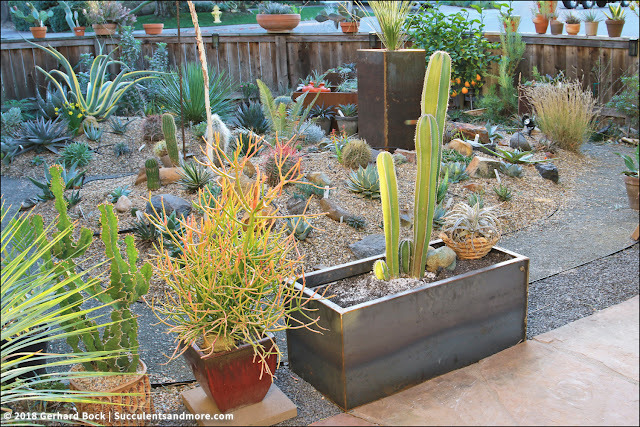 It's kind of surprising that one never sees Corten planters for sale here in Norcal--at least not in my experience. Really like what you've done with that narrow strip--it looks like you have ample room for a second planter-is that in the plan ? A small make over? That’s huge! I love what you’ve done, it all looks wonderful. 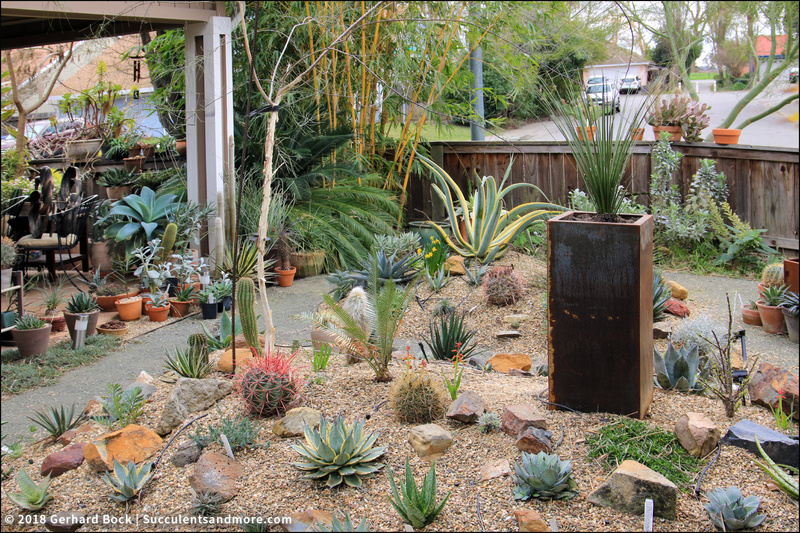 Great plants, great containers, and fabulous placement. Lovely! It brings focus to everything - interesting how having focal points does that. Love it all -- and seriously covet that 12X12 you found at Roger's! I covet that container as well. Perfect. The height added by the 3 planters adds considerable interest. I need to follow your example and invest in some tall pots, especially for areas with soil issues.